Holiday traditions are a lovely way to create lasting family memories. But do you have to bake cookies with your kids every year just because that’s what you did with your own mom? Or maybe you grew up without much holiday fuss and feel like you missed out; how do you go about implementing more festive fun for your own family? Are traditions still traditions when they’re invented from scratch? “Holiday traditions, and tradition and rituals in general, help families create shared meaning,” family therapist Megan Costello tells us. She brought up another way of looking at traditions: “In building a family life, parents are creating a whole new culture that has never existed before.” That’s right, parents: great power, great responsibility. 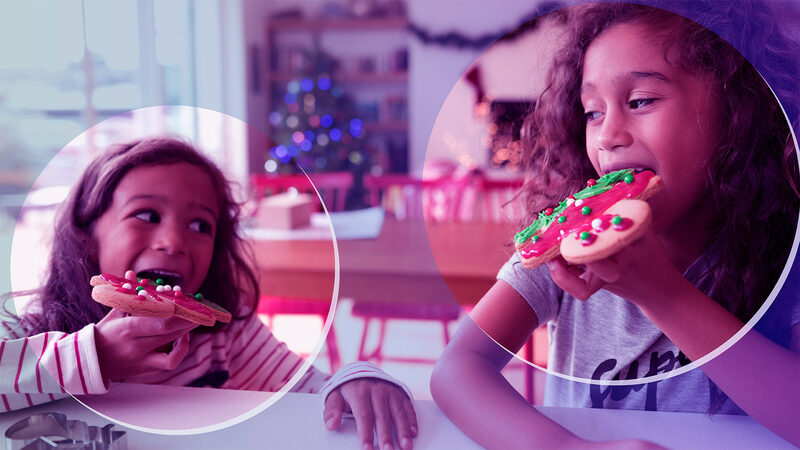 Luckily, there are plenty of ways to create brand-new holiday traditions for your own kids, regardless of what kind of holidays (or lack thereof) you grew up with. Just try to look beyond Elf on the Shelf (but no judgments — we definitely have one of those) to create unique opportunities to share this special time of year. Below are tips on how to start new holiday traditions tailor-made for your own family — inspired by real parents who did just that. You’re not likely to stick with a tradition that you’re not interested in yourself. I love decorating (and eating) cookies, so holiday baking was a natural choice for my family. I let my kids help with the mixing and have them cut out some of their own cookies with cutters, and they get to decorate a few. Even though it can be stressful to bake with preschoolers, I grin and bear it because they love to “help.” Plus, they love to be involved in making gifts, and we love to give out edible treats. And I know that when they’re older, they (hopefully) won’t spill flour all over the kitchen, but we’ll still have our annual baking tradition. Is there something special about the area you live in that you can incorporate into a holiday event? “Since we live in Southern California, we go to the beach on Christmas Day,” says mom Sarah Grubb, who started a unique tradition with her 21-month-old son. “We get a shell each time and put it in a jar.” A Christmas shell jar? Adorable. Mom of two Katie Szurpicki is originally from Nebraska, but she also takes advantage of her current Los Angeles locale. “Now that we are in California, we hike on holidays,” she says of her new family tradition. Soak up that sun when you can! And speaking of nature, mom of one Megan Persson, who lives in Sweden, plants her Christmas trees after the holiday is over. “Each year, we buy a living Christmas tree, which we plant on our land once the ground thaws, and we’ve named the ‘Christmas forest’ after our daughter,” says Persson. “We will take a picture each year with her next to her Christmas forest and let her witness herself grow in relation to the trees.” Is that a magical idea or what? “We want to teach her the importance of being a good steward of nature,” explains Persson. Get the family involved in no-stress activities like singing carols, decorating or even just wearing matching pajamas. Anything that fosters bonding is a great idea. “We’ve tried other traditions, but this one has stuck,” Sarah Robinson says of her family’s matching holiday pajamas. “My oldest, who is now 5, looks forward to it and knows it’s ‘our thing.’” I too got my family matching Hanna Andersson pajamas for Christmas. And yes, I bought them in October — that’s how excited I am. Whatever new tradition you decide to start with your family, getting kids on board is key; don’t drag them into something they’re not psyched about. “The hallmark of a successful tradition is to create one that your loved ones look forward to and that can be shared for years to come,” Summers advises. The best way to do that? Take into account your kids’ input and interests, because these traditions will likely make up a big part of their childhood memories. Remember what we said about great responsibility?